When we see our favorite zoo escapees this time, they are on the run with their jungle friends in Europe. Alex (Ben Stiller), Marty (Chris Rock), Gloria (Jada Pinkett Smith) and Melman (David Schwimmer) desperately want to get back to Central Park. Standing in their way is Captain Chantel Dubois (Frances McDormand) as the most evil animal control officer in the world. They narrowly escape her clutches by jumping on a train with a traveling circus. Now their only hope for getting to New York is to buy the circus and whip them into good enough shape to earn a touring contract in America. Director and screenwriter Eric Darnell does an excellent job of leading the crew with this third installment. The story incorporates new characters beautifully by adding a love interest for Alex (Gia, voiced by Jessica Chastain), a dopey friend for Marty (Stefano, voiced by Martin Short), and a fallen hero everyone can cheer for (Vitaly, a tiger voiced by Bryan Cranston). King Julien (Sacha Baron Cohen) also finds love in a big bear wearing a tutu named Sonya, and the results are as hilariously sweet as the love saga of Donkey and Dragon. Kids will be able to keep up with all of the new names and nationalities and may even find a new favorite character in the bunch. What makes this movie truly magic is the skillful use of 3D technology. Every leap on the flying trapeze, flight out of a cannon, and grasp at an animal’s tail by Captain Dubois jumps out of the screen and excites the senses. It is so refreshing to see a movie in 3D that actually takes full advantage of its capability. The clever script and silly animation also kept me laughing, but I could have done without all of the jabs at people of Russian, French, Canadian, and basically all non-American descent. What was initially funny drifted toward mean, and resulted in one joke that was totally inappropriate. These moments only accounted for about 5 of the nearly 90 minutes of running time, so do not let that deter you from enjoying this chaotic adventure. 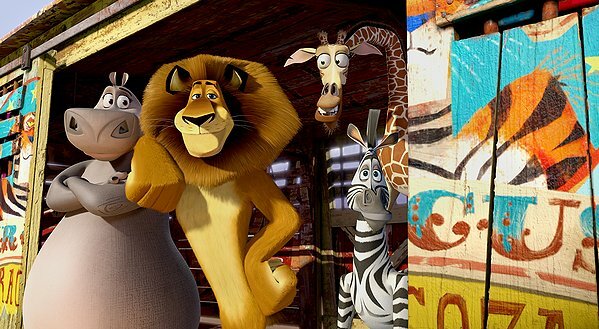 Madagascar 3 is just like going to the circus, but with more laughter and less wondering about how the animals are treated backstage. If you still like to “move it, move it,” then you need to see it see it!